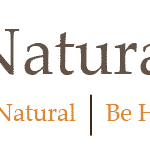 Sweet Potato Pasta with Walnut-Sage Sauce | Naturally. I think in a different life, I’d be an herb farmer. There’s something so dreamy about being surrounded by herbs and I’ve found that it’s about the only thing I can easily grow in our small patio garden. If I’m having a stressful day, I walk outside and pick a bit of marjoram to rub in my hands and smell. I swirl rosemary twigs in my water and add thyme to as much as I can. Sage is one of the herbs that does well in our potted garden. It’s also an herb I’m always experimenting with in different recipes. 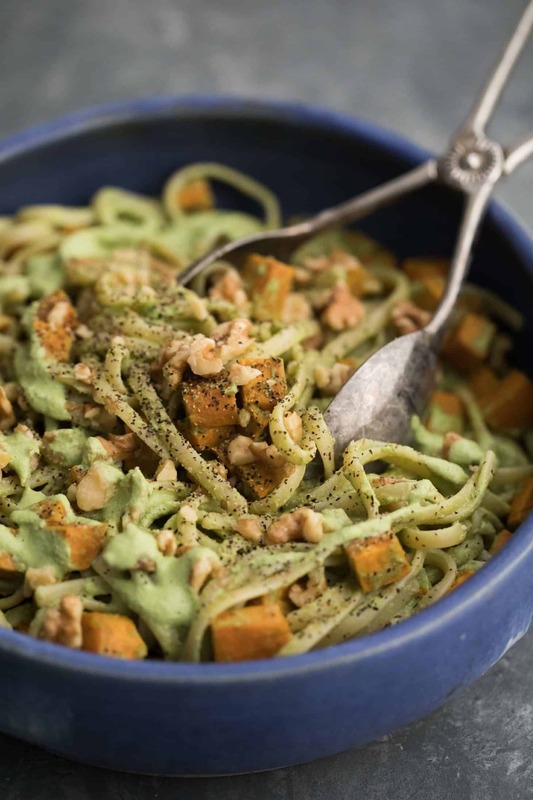 This sweet potato pasta uses fresh sage in a pesto-like sauce combined with nut cream. The end result is a unique fall pasta that also happens to be vegan. 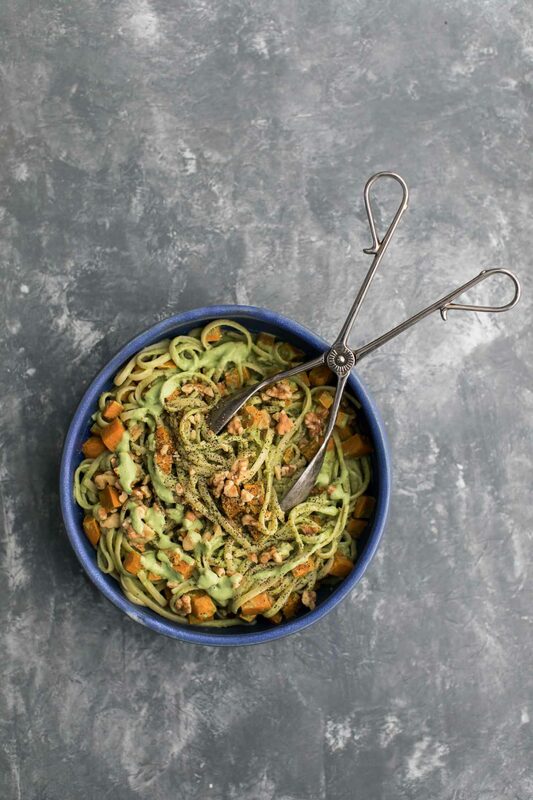 A hearty vegan fall pasta featuring roasted sweet potatoes tossed with a delicious walnut-sage sauce. Preheat oven to 425˚F. Peel the sweet potato then cut into ½” cubes. Place on a roasting tray and toss with melted ghee and salt. Roast for 30 minutes or so until the sweet potatoes are tender and starting to brown. While the sweet potatoes are roasting, cook the pasta according to the box; until just-tender. Drain and set aside. Drain the walnuts from their soaking liquid and combine with ⅓ cup of water, baby spinach, sage leaves, oil, lemon juice, and salt. Puree until well combined, adding a bit more water as needed until smooth and a good sauce consistency (think cream consistency). Place the hot pasta in a large bowl and add the sweet potatoes and sauce. Alternatively, place the sauce in a large pan and heat over low heat until the sauce is hot, but not boiling. Remove from heat and add in the pasta and sweet potatoes. Toss until the noodles are well coated. Top with toasted walnuts and fried sage before serving. 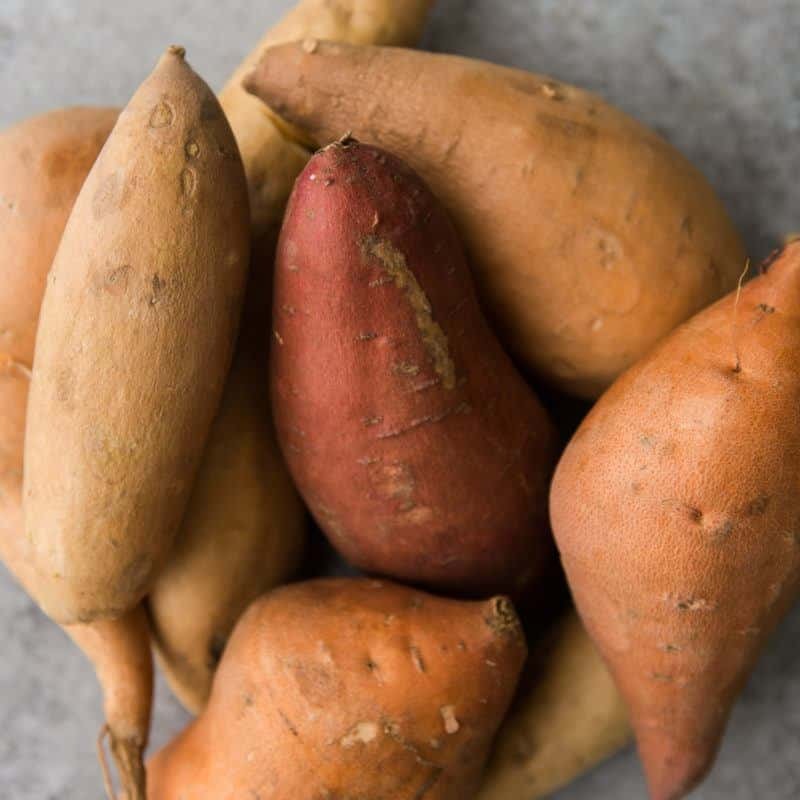 Tips & Tricks: Roast the sweet potatoes ahead of time to make this dish quicker. Also, if the sauce is too thick, add a bit of the pasta water to help thin the sauce down before serving. Nuts: swap the walnuts for pecans or almonds. Need to make this nut-free? Try using sunflower seeds. Vegetables: Use up all that fall produce. Butternut squash, delicata squash, and Brussels sprouts are all favorites of mine. You could also add wilted greens such as spinach, collards, or kale. Greens/Herbs: Swap the spinach or kale or chard and use different herbs to create a different profile. Add a bit of rosemary or thyme along with the sage. or go a completely different direction and use up your garden basil before winter! YUM! The sage walnut sauce looks fantastic! I know some people aren’t fans of sage, but I love it!! In the fall especially! This recipe sounds wonderful! Sage would go beautifully with sweet potatoes, especially those purple ones we are frequently able to get. I very much appreciate pasta sauces that are not tomato-based – tomatoes are way over used for things like that, and I am basically sick of that flavor. Yum! I made this tonight and was hesitant when I test tasted the sauce on it’s own at first. The sage was overwhelming and slightly bitter, which worried me. However, when I added the sweet potatoes and garnished it with the toasted walnuts, it completed transformed the sauce into something wonderful! All of the ingredients create a beautiful balance that creates a very unique taste. I’m excited to make this again in the future. Thank you so much for this recipe! I made this recipe again tonight but used arugula in place of the spinach since that’s all I had. I also made chicken on the side for my fiance who is not vegan. He’s a very picky eater and rarely likes any of the food I make, but he ate his entire plate with this recipe! This will continue to remain a recipe I go to when I need a little extra sage in my life. Again, thanks so much!